Mark Wahlberg; Christian Bale; Amy Adams; Melissa Leo. Disappointingly traditional sports story about two brothers from Lowell, MA who enjoyed different levels of glory as professional boxers. Wahlberg plays Micky Ward, who is younger brother to Dicky (Christian Bale), who remains a big-shot in Lowell because he once held his own in the ring with Sugar Ray Leonard. In that fight, Leonard fell down, and the town continues to argue over whether it was a knock down or simply a slip. Either way, Dicky is chummy with the whole working-class town, especially with a group of crackheads he spends time with. Micky has looked up to Dicky (yes, the names are annoying) his entire life and is hard at work training for his shot at the title. Dicky acts as trainer, but with a crack habit like his, he isn’t exactly the most punctual worker. Micky excuses Dicky over and over again, until a fight in Atlantic City when the original opponent of Micky’s is unable to fight. He reluctantly agrees to fight a man fresh from prison, who outweighs him by 25 pounds. Micky’s clock gets cleaned. Meanwhile, their not-exactly-classy mother, Alice, played by Melissa Leo, acts as a sort of manager to Micky. She is fiercely protective of her two sons. She is also protective of her seven daughters. She and Dicky often speak of the importance of family even as that same family is keeping Micky from any real success. Micky spots Charlene (Amy Adams) in a local bar, where her cleavage and famous rear end are two of the main attractions. She is feisty and smart and holds her own against the drunks in the bar. Micky is instantly smitten (as was I). Will Dicky drag Micky down? Will Micky turn his back on the family? Will all seven of his sisters hate Charlene for making their brother happy? Will Alice smoke another pack of cigarettes? Will Micky get his shot at the title? Wahlberg plays Micky as a timid, though buffed, brother who seems to love the shadow of his hyper-verbal older brother. We never get a real feeling for why he wants to box. It doesn’t seem to give him any joy. His scenes with Adams are pretty good, but when she sticks up for him, it sure seems like he’s substituted one mouthpiece (Dicky) for another (Charlene). Amy Adams is adorable. She attended some college before dropping out due to partying too much. She was an elite high jumper, but now works in a bar. She’s one of those movie constructs where a hot woman makes a man the best he can be, even if she needs force him to go against everything he knows. Melissa Leo is just this side of a caricature. If she wasn’t such an acting stud (see FROZEN RIVER or HOMICIDE), it would be laughable. She’s all tight skirts, a poofed up hairstyle, animal prints, and potty mouth. Why she continues to worship the ground her crackhead son walks on is never explained. Unfortunately, each one of the sisters is there to make the audience feel superior. They appear to be real women from around the way in Lowell. Each sister’s hairstyle requires more Final Net than the last. Each accent is stronger than the last. Each pair of white Reeboks and acid-washed jeans and half-shirts is more stereotypical than the last. The film takes place in 1993 and some allowance can be made for their fashion sense. But oh, the hair. My goodness. The sisters immediately hate Charlene because she’s been to college and has engaged in, you know, book learnin’. There is no group of sisters so ridiculous. When they all cram onto a sofa for a family meeting, it’s like a rouge’s gallery of the rejects from a Whitesnake video. Whitesnake, incidentally, is the music played when Micky enters the boxing arena. Here I Go Again, indeed. The entire film would have crumbled under it’s own seriousness if not for the performance of Christian Bale. He’s already rightly famous for the lengths he goes to physically in changing his body to fit the role. Here, he needs to be crackhead skinny, but not only that. He also needs to look strung out, yet energetic. He needs to be lanky and unwashed, but ready to spar in a boxing ring. His eyes are hollow and he’s got the accent down. He also made me tear up several times. He is all bravado and self-delusion. A camera crew from HBO is following him around–he says to film his comeback, they say to film stories about crack addiction. I believed that he was HNIC in Lowell. He is charming enough for people to look the other way at his drug habit, a fact that hurts him obviously more than it helps him. The boxing scenes were pretty good. There aren’t many ways to film fight scenes that hasn’t already been tried, but this film finds a way. All of the action that takes place inside an arena is filmed on video, like we’re watching the HBO tapes. It really was effective. I forgot once in awhile that I was watching a movie and wondered why Adams and Bale were in Atlantic City watching a fight. Wahlberg is passable as a boxer, I suppose. We don’t really see that much boxing, though. The announcers are the real team from HBO and Michael Buffer does the intros. I’m not sure if they used the actual transcripts, but this is the kind of film where an announcer will say “Micky’s finished, someone should stop this thing” exactly when Micky finally lands a punch that hobbles his opponent. 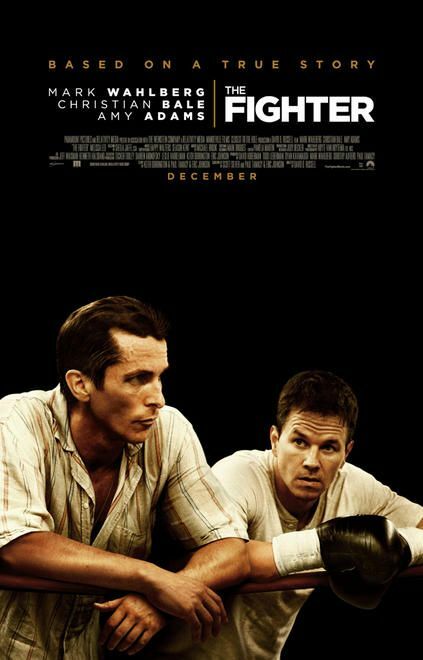 Perhaps to someone new to boxing films, the things done in this one will be spectacular and riveting, but I was tired of hearing “he’s getting killed” and “this unknown is taking way too much punishment”. Good use of locations. Exciting editing and pretty great use of music. That is, when it wasn’t hitting us over the head. “Back In The Saddle” by Aerosmith is played, when not one, but two characters are shown “back” where they belong. This film had the surprising inclusion of the greatest bass drum song of all time, “Good Times, Bad Times.” I’d always heard that Zeppelin was too expensive to license (see ALMOST FAMOUS). I’m a sucker for sports movies. I inevitably tear up a little when our hero’s dreams are fulfilled (“Rudy, Rudy, Rudy”; “Rocky, Rocky, Rocky”; “Hey Dad, Wanna Have Catch?”) and this one was no exception. And Bale is remarkable. I hope he’s remembered during awards season. The rest of the film, is way too paint-by-numbers to be anything above the ordinary. This entry was posted on Monday, December 20th, 2010 at 9:48 pm and is filed under 2010, Camera 7, Theater. You can follow any responses to this entry through the RSS 2.0 feed. You can leave a response, or trackback from your own site.